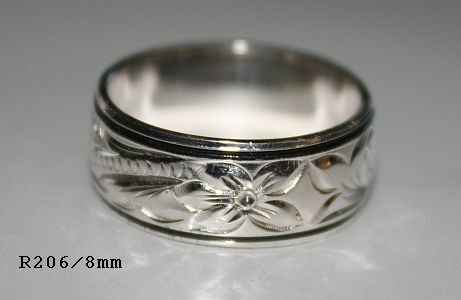 This is a very stylish hand carved unisex Hawaiian style wedding from the Hawaiian jewelry collection. Beautifully hand crafted in solid Sterling Silver with Hawaiian Plumeria, frangipani and Hawaiian scroll design. Both edges have an inset ring of black enamel. 8mm wide band, weight 6 grams. Can also be ordered with a 6mm wide band and other sizes - please enquire. Limited quantities for this item. 2 x 10, 2 x 9, 2 x 8, 2 x 7, 2 x 6, 2x 5, 2 x 11, 2 x 12 in stock.